Along the ocean shorelines of the west and east coasts there are plenty of wonderful volunteer efforts to clean up the debris left behind on those marvelous beaches. Just because Albany isn’t on a coast doesn’t mean there aren’t waterways that can’t benefit from that kind of cleanup effort. Recently a group of likeminded volunteers gathered to help clean up Periwinkle Creek. This was part of the annual “Down By The Riverside” cleanup event. The focus this year was on picking up the fast food wrappers, soda cans, shopping carts and tires that were carelessly left behind at Periwinkle Creek. The goal was to get that trash picked up before the fall rains come and swell the creek. That in turn could send that debris all the way down to the Willamette River and that’s not going to be good for anybody. What’s great about an event like this is that is that all ages were welcome to join in on the cleanup crews. This made for a perfect teaching opportunity. The best way to stop future, reckless dumping is to teach the young ones why it is so wrong. When it comes to your own home wouldn’t it be great to have your own group of volunteers to sweep through and pickup your debris? Chances are that’s not going to happen but it doesn’t mean you can’t get help. You can hire Junk King of Albany to provide you with professional junk cleaning removal services that will leave your home debris free. Right now most of us have plenty of junk we can toss out but what about those special projects that we know will create even more junk? We’re talking about things like a DIY remodeling job in the kitchen or bathroom. Or a landscaping make-over for your front yard. In either one of those scenarios you’ll be creating piles of all kinds of debris. You probably won’t be able to fit all that trash into a garbage can which is why you should plan ahead and have Junk King Capital District standing by for the removal. No matter what kind of trash, junk or debris you want carted off Junk King can handle the job. The moment you hire Junk King Capital District you’ll be hiring the services of a team of licensed and insured workers. That makes them completely responsible and dependable. Yes, it’s true that the Junk King Crew won’t be working long at your home like a general contractor would but that doesn’t mean they should be any less professional. Junk King not only respects your property but they also respect your time. That’s why the appointments will be made around your schedule and unlike other companies, Junk King won’t keep you waiting. When we say we’ll be there you can set you clock by that! For debris removal large and small there is really only one choice: Junk King. This entry was posted in Albany Junk Hauling, Albany Junk Recycling, Albany Junk Removal and tagged albany debris disposal, albany debris removal, Albany Junk Removal, albany removal on September 27, 2012 by Todd Porter. Last updated August 1, 2017 . Did you take part in the great e-waste collection event? According to the mission statement, the purpose for this event was “To create an awareness for safe and proper recycling practices by providing a complimentary electronic recycling service to our local community, that safely disposes of household e-waste in an eco-friendly way.” As mission statements go that’s a pretty decent one. Unfortunately, this was a single day event that was held back in April. There were five locations around the area where folks could drop off their stuff but it was only from 10 a.m. to 2 p.m. and if you were busy that day you were out of luck. 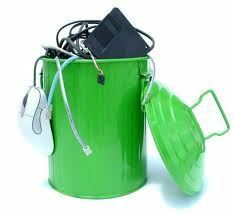 Just to review, here is what is considered to be e-waste: computer towers, laptops, servers, monitors, keyboards, mice, speakers, cords, cell phones, pagers, PDAs, Palm Pilots, cameras, camera chargers, flat panel television, plasma television, glass monitors, desktop copiers, VCRs, DVD players, turn tables, stereos, clock radios, routers and telephones. That’s a pretty long list. The question becomes how much of that junk are you holding onto because you have no way of getting rid of it? Well, now you have a way and that would be with Junk King. Ever since they started collecting junk in the Albany area Junk King Capital District has quickly risen to the ranks of becoming the city’s leading junk removal experts. Because so much of our useless stuff can be considered e-waste, Junk King makes it their business to properly dispose of those items and ensure they don’t end up in a landfill. That’s because of all the kinds of trash we throw out e-waste needs the most special attention. All the components in a computer or TV or even a cell phone need to be separated and sorted. Technically, you can call up Junk King and have them cart off your old computer and monitor in a single trip. However, it’s to your advantage to make that “trip” count. You can do that by tapping Junk King Capital District for the removal off all your unwanted items. Go through your closets, attics, basements and garages. You’re sure to discover plenty of things you can toss out. Maybe it’s finally time to reclaim all that space and turn it into a more productive area. The garage can become a wonderful arts and crafts work station. The basement can be transformed into a family home theatre. The attic could be a guest room. First, you have to get rid of all the junk. That’s where Junk King comes into play. Start with the old computer and finish with a totally junk free home! This entry was posted in Albany Appliance Disposal, Albany Junk Recycling, Albany Junk Removal, Junk King Capital District, New York Recycling and tagged Albany Electronics Disposal, Albany E-Waste, New York E-Waste Disposal, NY E-Waste Recycling on September 19, 2012 by Todd Porter. Last updated August 1, 2017 .